Any AR-15 and AR-10 barrel that has a .625" diameter at the gas port area. There are few things more frustrating than needing to readjust an adjustable gas block and finding it won’t do what it’s supposed to after it’s been on a working weapon for a while. SLR Rifleworks Sentry 6 is a patented .625 adjustable gas block that’s designed to take the frustration out of gas tuning for the long haul. What’s Special About SLR Sentry 6 Gas Blocks? 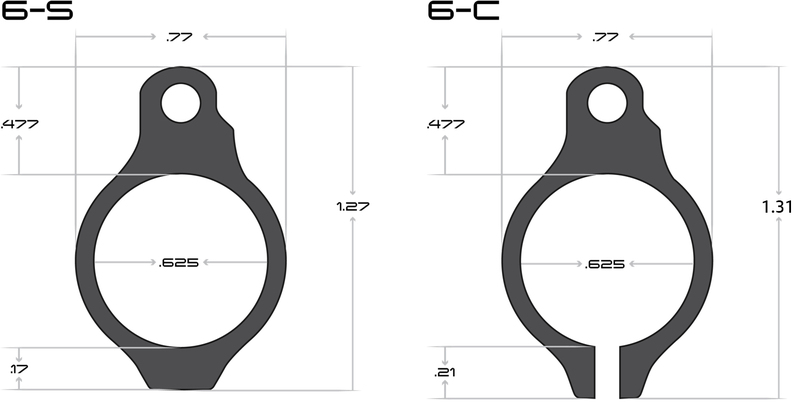 SLR Rifleworks builds their Sentry Adjustable Gas Blocks on a patented design that’s intended to greatly improve the functional adjustable life of the .625 adjustable gas block and its .750 brethren. The SLR Titanium Sentry 6 Adjustable Gas Block features a special metering screw bore as well as a precision designed metering screw and an advanced designed and high-temperature tempered flat spring that come together to create an adjustable gas block that promises to give a truly functional life, even after the rifle system it’s mounted on is put to serious use. When other adjustable gas blocks clog up and stick, or just won’t adjust, the SLR Sentry 6 will keep working as it should. Like the rest of the SLR Sentry Gas block ling, the SLR Sentry 6 Titanium Gas Block features a quality Melonite coating on the metering screw and detent plunger. The corrosion resistance and lubricious nature of Melonite help it to shed fouling and resist corrosion. That means you enjoy freely adjustable gas port metering even as you continue to operate your firearm. Choose the SLR Rifleworks Sentry 6 Titanium Adjustable Gas Block from Wing Tactical and give yourself an edge.